In official books and tourist guides we can read a lot of information about every city. But there is a kind of information, which official sources for various reasons are not providing. In order to learn this information, one needs to live in a given city. This is because such information can only be learned from our good friends or a trusted person. Officially such kind of information is not disseminated. This web page tries to provide just such "whispered" information about the city of Wroc�aw - i.e. the details which normally are difficult to hear. It originates from years 1964 to 1981 - means from the time when I had the pleasure to live in this city. Of course, in order to indicate exactly with which section of the city it has a connection, it was necessary to repeat here also several pieces of information of the tourist-guide type - on the background of which these "whispered" ones are explained. This web page has several goals. The first of these is to show Wroc�aw to the reader from a bit different angle than it is done in official guide books. Another goal is to reveal how fascinating is the history of this old city and why it is worth to continue our interest in the further fate of it. This web page aims at presenting folkloristic stories and curiosities regarding Wroc�aw, not scientific facts on this city. This practically means that whatever is presented here, it tries only to repeat and illustrate faithfully what various people used to tell, claim, or believe about Wroc�aw. (After all, in old times there were not so many TV sets as today, while these which were, no-one watched continually. Thus, during long winter evenings people used to entertain themselves with various stories. Also even when this page repeats whatever someone knew for certain, still this information could be infiltrated by various errors caused by memory tricks.) This page is NOT aimed at proving or verifying how much of what it says is true, nor what factual, historical, or scientific value it has. Furthermore, the very nature of the information presented here is such, that even if these folkloristic stories contain exclusively historic truth, still in present times most probably it would not be possible to scientifically prove that this is scientifically correct. Therefore the matter of judgement about the level of truth in what is presented below, I leave to the discretion of readers. Please notice that this web page about the city of Wroc�aw is one amongst a whole series of web pages which I prepared on the subject of "whispered", or spoken only unofficially, mysteries and curiosities of places in which I lived, or which I researched, at some stage of my life. Many amongst these places are characterised by this extraordinary fact, that I lived in them and got to know them, when they still belonged to "totaliztic locations" - means to places on the Earth which I had the pleasure to get to know when the inhabitants which settled in there just after the World War Two, were still practicing the highly moral philosophy of totalizm. (Unfortunately, apart for one amongst these places, all remaining places by now started to practice the highly immoral philosophy of parasitism - the adhering to which is severely punished by God with deaths and cataclysms - as this is illustrated and explained in item #B5 of the web page named seismograph.htm.) Other similar my web pages that also describe such places which in times I lived in them were "totaliztic locations", include the page about a Lower Silesian village of Stawczyk and Wszewilki (from Poland), a web page about the Silesian town of Milicz (also from Poland), a web page about the totaliztic village of Cielcza near Polish town Jarocin, a web page about curiosities and mysteries of the castle of Teutonic Knights in Malbork (Northern Poland), and also two web pages about curiosities of New Zealand (i.e. pages physically named petone.htm, Tapanui, New Zealand, or newzealand_visit.htm) and about curiosities of Korea (i.e. pages physically named korea.htm, or hosta.htm). Notice that complete internet addresses of web pages indicated here appear in the address window of your internet explorer only after you click on links to these pages (in the text these links are emphasised with green colour). Wroc�aw is a sizable city located in Silesia region of Poland, means in the south-west corner of present Poland. It is known in the entire Poland as an "academic city". A number of universities is located in it. For example, if I still remember it well, in times of my studies, means in years 1964 to 1970, it had as many as 8 different tertiary educational institutions, namely (in the order of students numbers): (1) The Technical University of Wroc�aw - which I finished, (2) The University of Wroc�aw, (3) The Wroc�aw Medical Academy, (4) The Wroc�aw Farming Academy, (5) The Economic College in Wroc�aw, (6) The College of Arts in Wroc�aw, (7) The Musical Academy in Wroc�aw, and (8) The Military Academy in Wroc�aw. The unusual aspect of Wroc�aw was, that immediately after the Second World War the entire population of that city was exchanged into a new one. In turn, as this is explained to us by the philosophy of totalizm, such an exchange of entire city population onto completely new people causes that in this city do NOT exist nor operate any more various old "groups of school colleagues" nor "old boys networks" which would cause that a given city sticks to immoral principles of "whom you know" and "mutual backing", instead of totaliztic principles of objective "taking people for what they really are". In the result, until around 1980s, Wroc�aw was almost completely free from the institutional parasitism - means from a highly immoral "group philosophy" the attributes of which are described in the Bible as characteristics of "unjust" people, which God clearly warns in the Bible that they will be punished by death - see "Book of Ezekiel" verses 33:18-19 discussed in item #A1 of the web page named seismograph.htm. (About the fact that all communities which fall into claws of that highly immoral philosophy of parasitism actually are punished by God with deaths, cataclysms, and with severe ill-fortunes, certify research which I already completed, and which I described, amongst others, in item #B5 from the web page named seismograph.htm, or in item #B4.4 from the web page named mozajski_uk.htm.) In other words, starting from 1945 until 1980s, Wroc�aw performed the function of a "totaliztic city" and belonged to an "exclusive club" of unique "totaliztic places" which the author describes, amongst others, on his web pages named milicz_uk.htm, stawczyk_uk.htm, and wszewilki_uk.htm. The fact that in years 1945 to 1980s Wroc�aw was a "totaliztic city" turns it into a very precious object for "moral research". After all, on the entire world can only be identified a shockingly few such "totaliztic cities", while the ones that are known as "totaliztic" practically are NOT researched by anyone as "group intellects". On the other hand, "totaliztic cities" are unusual. For example, almost everything that their inhabitants intend to accomplish, always is implemented, they are an excellent example of moral coexistence of their inhabitants, they display dazzling achievements in every area, etc., etc. To give here an example, I was a "professional lecturer in tertiary educational institutions" who lectured on 10 different tertiary institutions from 5 different countries of the world. This gave me an opportunity, to compare empirically the level of academic education from the Technical University of Wroc�aw, with levels that prevailed in other universities of the world - including these most famous ones. As I determined, according to my unofficial comparison estimates, in times when Wroc�aw was the "totaliztic city", the Technical University of Wroc�aw was the best university in the world - I am explaining this fact more exactly in item #E1 of the web page named rok_uk.htm. Thus, even just for that reason, it is worth to pay a special attention to that extraordinary city. Unfortunately, after the year 1980 Wroc�aw gradually lost its status of a "totaliztic city". This in turn introduces quite unpleasant consequences, clearly named and described in the Bible. As the result, from what I have heard, Wroc�aw was "warned" already twice with powerful "warning floods", while once even with a tornado that appeared in it. So if in the nearest time Wroc�aw considered as a single "group intellect" does NOT document clearly that it changed the kind of philosophy which it practices and does NOT return to the previously practiced philosophy of totalizm - as this is explained more thoroughly in item #E2 from the final part of this web page, then there is a real danger that in not-too-distant future it can be treated to something that can be described as the "urging cataclysm". This means, that there is a possibility that Wroc�aw is to experience a fate similar to the fate of city Christchurch in New Zealand - as this fate of Christchurch was described in items #C5 to #C6 of the web page named seismograph.htm and in item #G2 of the web page named prophecies.htm, or experiences the fate similar to the fate of the city New Orleans in the USA - described in item #D1 of the web page katrina.htm. Besides, together with Christchuch in New Zealand and with New Orleans from the USA, Wroc�aw is one amongst the group of several cities of the world located outside of the areas typically troubled with earthquakes, about which it is known for sure, that as so-called "group intellects" they are NOT protected from cataclysm due to inhabiting in them at least "10 righteous" - the protective role of which is documented, amongst others, in item #I3 from the web page named day26.htm. Just only for that reason, it is worth to begin watching closely the further fate of Wroc�aw. This fate is also worth to watch closely for the scientific exactitude - after all, whatever happens to Wroc�aw, a factual documenting may one day adopt also as a descriptive model of what later can be extrapolated to other cities of the world which have a similar philosophical situation. Current population of Wroc�aw is difficult to estimate. After all, the present administrative boundaries of Wroc�aw do NOT coincide with natural breaks in human settlement. However, a rough estimates state that in 2004 Wroc�aw itself was populated by around 700 000 people. But if one includes into this number also population of suburbs, then this number exceeds 1 million of people. Wroc�aw is considered to be the fourth largest city of Poland (after Warsaw, Katowice, and ��d�). Everything started because of this amber. In ancient times it was a hugely priced commodity. It was appreciated for its ability to heal and to strengthen. (As the reader probably knows, the electricity induced during wearing amber interacts with acupuncture points on the body of wearer, thus improving the health of the wearer - in a similar way as this in done with a present kinds of needless acupuncture, also called the "energy acupuncture" or a folklore "bio-acupuncture".) But in order to acquire this precious amber, merchants needed to arrive at the Baltic Sea, into the vicinity of present Gda�sk. The route by which they then travelled, later called the Amber Route, needed to be selected carefully, because it needed to lead through areas populated by peaceful tribes which welcomed travellers. In the first stage of the existence, means still in antiquity, this "Amber Route" was officially leading from the city of Aquilei in the vicinity of present Triest by the Adriatic Sea, to Gdansk and to the Gdansk Harbour, passing along a huge arc through the Roman province of Pannonia, means present Hungary, then by the Moravia Gate, Kalisz, through the Lake Gop�o to Wis�a (Vistula) and then along Wis�a to Gda�sk and to Gdansk Harbour. But with time it turned out that there is a shorter and more convenient route that leads to the same goal. In this way was created more direct branch of the "Amber Route", which led through the present Wroc�aw, and then through Milicz (and nearby village of Wszewilki) and Gniezno to Gda�sk. (The huge influence that this "Amber Route" exerted on the development of a small town Milicz, and nearby village Wszewilki, explain separate web pages (listed in "Menu 1") about Wszewilki, Milicz, and also about the church of St. Andrea Bobola in Milicz - this last web page is available only in Polish.) Similarly as this was with the original "Amber Route", also this later branch of it that led through present Wroc�aw, Milicz and Gniezno, cut on its way over several large rivers. One of these rivers was Odra. Of course, in order to pass on the other side of Odra, when there were no any bridges, merchants needed a convenient wading place through this wide river. Such a wading place existed in the area where Odra spread into several junctions which surrounded small islands. Thus, beginning since around 800 BC, on both sides of the Odra river, near this wading place, two fortified settlements were established. After all, travellers who were to ford through the river needed a secure and a safe place to spend the night and to rest, which was provided by these fortified settlements. With the elapse of time the settlements transformed into what presently is the city of Wroc�aw. There is a body of material evidence that Wroc�aw in fact was located on one of branches of the "Amber Route". This evidence is a "treasure" in form of large quantities of ancient amber which in 19th century was found in the suburb named Wroc�aw-Partynice. One historical source states that there was 800 kg of this amber, while other source - less reliable, that was 2500 kg. This amber supposed to originate from the turn of two millenniums, namely from times when Jesus was born. The largest lump weighted 1750 grams. So huge amount of amber would not be transported to Wroc�aw, if this city does not lie on the "Amber Route". Besides, areas that lie on the formed "Amber Route" are known from ancient amber treasures. Another such a treasure was found in 1914 in Bassonia by Wis�a, near Pu�awy, in the Lublin area. It contained 300 kg of raw amber and 30 kg of ready-made amber beads. As I explained this on the web page about Milicz, in times of my youth probably a similar amber treasure was found in Milicz. But it was never officially reported to authorities, nor scientifically catalogued. With fragments of it we simply played as small children, until they were completely destroyed. Between both fortified settlements, in the middle of the Odra river, two islands existed, presently called Ostr�w Tumski and Wyspa Piaskowa (i.e. Sand Island). The access to these islands was defended from both sides of the river by two fortified settlements. No wonder, that with the elapse of time people started to build on them their homes and the beginnings of the city. After all, on these islands they felt more safe. In this way firstly the island "Ostr�w Tumski" was settled. In 900 AD, in such a wooden city located on the island named "Ostr�w Tumski" already lived around 2000 people. The city, then called "Vratislavia", was already a significant centre for trade and for craft. When the Christening of Poland took place, this widely known centre was selected for the location of bishop. So the importance of it was additionally lifted then. After all, from just a centre for trade and craft, it was additionally transformed into an important centre of church administration. The city began to rapidly grow then, in further years shifting also onto a nearby island called the "Wyspa Piaskowa". Simultaneously, from initially wooden buildings of the Ostr�w Tumski, gradually churches build from brick begin to grow up. Some of these churches stand over there until today. Wroc�aw is a sizable city located in Lower Silesia, means in the south-west corner of Poland. The oldest written record about Wroc�aw originates from 1000 years ago. It was then that a bishop of Wroc�aw was established. At that time Wroc�aw was called "Vratislavia". It was composed of two parts, namely of the bishop castle that was located on an island by the right side of the Odra river (just by the area in past used to ford this river), and of the city itself located on so-called Ostr�w Tumski (means on a small island located in the middle of then Odra river, in the area by which led an old wading place through this river). Around 1100 AD the city spread also on the neighbourly "Wyspa Piaskowa" (i.e. "Sandy Island"). In 1163 AD the construction of the prince castle was finished and Wroc�aw become the capitol of the duchy of Silesia. The prince's castle was build next to the bishop castle, together forming a double fortification complex. In 1214 AD, in the document of the Prince Henryk Brodaty, a Wroc�aw Administrator appeared named Godinus. This means that Wroc�aw functioned already then as a city administrative territory. In 1242 Wroc�aw obtained a location rights based on the German law. In 1335 Wroc�aw was annexed by Czechs and shared the political fate of the entire Silesia. In 1526 the city was annexed by Habsburgs. In 1741 the city, as well as almost the entire Silesia, was annexed by the Kingdom of Prussia. Since 1806 to 1811 Wroc�aw is occupied by forces of Napoleon. Napoleon himself felt offended by the ironic, although highly diplomatic speech of the mayor of city Wroc�aw from that time, described in item #D11 below, which speech was to reply to the Napoleon's question "why there were no cannon salutes to greet me?". As a revenge for this speech, on the personal order from Napoleon, the city walls were then dismantled in Wroc�aw (only the moat remained until today), as well as dismantled were the town walls in the belonging to Wroc�aw nearby town of Milicz. Just before the Second World War Wroc�aw was inhabited by 600 000 citizens. In the final part of the Second World War Germans defended Wroc�aw against the Red Army. The city capitulated only on 7 May 1945 - i.e. after 82 days of siege by Russians. The Potsdam Agreement gives Wroc�aw back to Poland. Starting from 1945 Wroc�aw again becomes a Polish city. In Wroc�aw there is an old cathedral founded in the year 1000 AD by the king of Poland, Boleslav Chrobry - see "Fig. #D1" below. At present it is over 1000 years old. The unusual curiosity which during visiting this cathedral one should especially notice, are two disks shining silvery, which are placed on tips of needles erected on rooftops of both towers of this cathedral. These two disks are visible on the above photograph. They symbolise two telekinetic UFO vehicles, called also UFOs of the second generation. For propelling themselves these UFO vehicles utilise eight-sided propelling devices called Oscillatory Chambers, about which I also write in item #D16 of this web page. These eight-sided devices have this attribute, that they generate a technical version of telekinesis. In turn this version of telekinesis UFO vehicle utilise later for propelling purposes, and also for making themselves invisible to human sight, for penetrating through walls, furniture, and other solid objects, etc. (The phenomenon which allows UFO vehicles to become invisible to human eyes, and also to penetrate through solid objects, is called the "telekinetic flickering". The more comprehensive description of this phenomenon is provided on the web page about the Concept of Dipolar Gravity.) When such a UFO of the second generation hovers exactly above someone's head in the visible state (i.e. after the state of telekinetic flickering is switched off), then people looking at it from below are able to see these eight-sided outlines of Oscillatory Chambers positioned in propulsors of these vehicles. Where exactly such propulsors with eight-sided Oscillatory Chambers are positioned in these vehicles, it is illustrated relatively well on Figures of Magnocrafts - which (the Magnocrafts) are in fact Earth's equivalents for UFO vehicles. Well, the most fascinating fact about these silvery disc from tips of needles on both towers of the Cathedral in Wroc�aw shown on the above photograph, is that if someone carefully looks at them from below, then in their centre he or she will see clearly visible outlines of eight-sided Oscillatory Chambers. So these outlines are further objects that exist in churches - and that are described in item #D16 of this web page, that imitate exactly with their shapes the objects that were seen by our ancestors on decks of UFO vehicles. Fig. #D1: This is a photograph of Wroc�aw Cathedral (founded by the Polish king Boleslav Chrobry, in 1000 AD). It originally was erected on the presently non-existing island named "Dominsel" from the old flow of the Odra river. This cathedral was the most significant source of the power, growth and prosperity of Wroc�aw. Please take notice of two silver discs that imitate UFO vehicles of the second generation, that are visible on tips of cones from tops of both towers. The above photograph was taken in July 2004, when the age of this cathedral already exceeded 1004 years. When Wroc�aw become a headquarter city for a bishop, the bishop who resided in it represented the highest local authority. Thus he firstly build a fortified residence. He located it on an island from the Odra river, in past called "Dominsel". Presently this island does not exist any more. Within boundaries of this fortified residence of the bishop, in 1000 AD a Wroclaw cathedral was erected. This cathedral is shown on the photograph from "Fig. #D1" above. With the elapse of time fortifications around the residence of bishop have disappeared. Also the branch of Odra disappeared, which located this residence on an island. However, the residence itself, and also the Wroc�aw cathedral erected in it, survived until present times in the same original location. Of course, in the meantime they were reconstructed and rebuild many times. Their present appearance is shown on photographs from "Fig. #D1" and "Fig. #D2". The above should be complemented with the information, that Wroc�aw bishops fulfilled a vital role in Wroc�aw during all this time. Practically it was because of them that Wroc�aw is now what it actually is. Almost always they also supported the belonging of Wroc�aw and Silesia to Poland. Especially well it is visible in beginnings of medieval times, when these were their castles and their soldiers, which fought with arms to defend this land from foreign aggressors - e.g. see the fate of the bishop castle from Milicz, which for a long time defended the western border of Poland. Fig. #D2: Here is a photograph of the present headquarter of the Catholic bishop of Wroc�aw. The increase in significance of Wroc�aw caused that with the elapse of time the capitol of principality was shifted to this city. Subsequently the Prince of Wroc�aw erected a fortified castle on the former island of Dominsel, near the fortified headquarters of the Wroc�aw's Bishop. This castle is described in 1288, on the occasion of founding by the Prince a church of Holy Cross (i.e. in Polish: "�w. Krzy�a"). The Prince's castle does not exist any more in Wroc�aw. The only thing that still remains from it, is a section of foundations of old fortification walls from it, and also a small castle church which is shown below on the photograph from "Fig. #D3". Fig. #D3: The above castle church of St. Marcin, plus a segment of foundations from fortification walls of the castle, are all that is left until today from the prince's fortified castle in Wroc�aw. In the present structure shown above, the church of St. Marcin was build around 1310 AD. But in the place of it a wooden chapel existed already in 1149. This is because the chapel was listed in the confirmation of ownership issued by the Prince Boles�aw II K�dzierzawy (who confirmed the chapel as being owned by the monastery of St. Vincent - means Benedictines). The above photograph was taken in July 2004. If the buildings of the prince's castle from Wroclaw survived until today, then most probably they would look like these ones shown on the photograph from "Fig. #D11" below. Old fortified castles used to maintain numerous underground tunnels and cellars in case of invasions. Exits from these tunnels were hidden in forests many kilometres from a given castle. The fortified castle of the Prince from Wroc�aw was not an exception from this rule. For sure it also had numerous underground tunnels that led from it in various directions. Many of these tunnels are probably still in good order even today. The problem is, however, that presently almost no-one investigates them, while the access to many of them was blocked. In medieval times entrances to underground tunnels usually were hidden in wells that, as a standard, were located on castles' yards. Even today many of such wells from castles contain these entrances to underground tunnels. For example, such entrances are in wells from: (1) the high castle in Malbork (this with the sculpture of a "pelican"), (2) the castle in Otmuch�w, south of Wroc�aw - see "Fig. #D4" below (from this well in Otmuch�w, tunnels run as far as the fort in K�odzko), and also (3) the castle of Teutonic Knights in Gniew (Northern Poland). In fact, every old fortified castle, including the castle in Wroc�aw, almost for sure used to have a well on the yard (i.e. in the castle's "keep"), with an entrance to underground tunnels. Only that in present times we usually do not know where these wells used to be located. Fig. #D4: The castle's well from Otmuch�w in Southern Poland (i.e. less than 100 kilometres to south from Wroc�aw). For just an average person from a street, the city of Wroc�aw seems to be an ordinary place. However, if the ground turned to be transparent, then everyone would got astonished. Under Wroc�aw another mysterious city is hiding, which takes the form of a whole labyrinth of underground tunnels. As every medieval city, Wroc�aw had an entire system of tunnels that were hidden under it. These tunnels were repaired and kept in a good order until the end of the Second World War. Only after the Second World War people gradually forgotten about these tunnels almost completely. Therefore by now the majority of these tunnels probably is in ruins. Photographed in July 2004. This tunnel is accessible for tourists in K�odzko. Entrances to it are located near the town-hall in K�odzko, and also near the K�odzko fort. But an entire labyrinth of underground medieval tunnels, very similar to that one, is located under the surface of Wroc�aw. Only that now almost no-one knows about their existence. Perhaps it would be worth while to consider making them available for tourists, similarly as this is done in K�odzko. After all, this would provide Wroc�aw with an additional tourist attraction, not mentioning about a source of income and bread for a number of people. Medieval cities had many entrances to their underground tunnels. As a standard, such entrances existed in undergrounds of practically all medieval churches (e.g. in Wroc�aw such entrance has the cathedral of St. Elisabeth Hungarian - in Polish "katedra �w. El�biety W�gierskiej" (St. Elisabeth of Hungary) by the central square), and also in almost all undergrounds of official buildings (e.g. city hall, armoury, castle, defence towers, barbicans, etc.). But by now the majority of these entrances was walled up. Almost the only place in Wroc�aw, about which it is a common knowledge, that until today it has such an entrance to underground tunnels, are remains of an old defence fort by the southern gate to the city. The present location of this old fort is now called the "Wzg�rze Partyzant�w" (meaning "Partizans Hill"). The Wzg�rze Partyzant�w in times of my studies - means almost a half century ago, was famous from the fact that in evenings and at nights "spooks" were active up in there. It was whispered, that on this hill ghosts of medieval prisoners tortured to death in a whole labyrinth of catacombs and underground tunnels located under Wroc�aw, which begin from this hill. Now, on the basis of my UFO research, I personally explain this old "spooks" completely different. Namely I have reasons to state, that half-transparent creatures and flying human shadows that then were seen frequently on this hill, are simply "simulations of UFOnauts who in undergrounds of this hill probably had (and perhaps still have until today) their underground basis, similar to the UFO basis existing under the town of Malbork - for details see the web page about Malbork available through "Menu 4". During flying into this basis, or during emerging from it, these "simulations" of UFOnauts probably accidentally scared couples in love, and others who after darkness ventured to this hill. After all, magnetic personal propulsion system used by UFOnauts, gives to them partial or complete invisibility, changing these UFOnauts into a kind of flying shadows, by people taken for ghosts. The logically explainable cause for which "simulations" of UFOnauts have a number of "underground bases" spread over the entire world, is their strategy to "continuously hide from people". After all, UFOnauts are "simulated" as cosmic robbers, thieves, and bandits, completely deprived of human feelings and humane behaviour. Although they are "simulated" to look like closest relatives of people from Earth, and although they look exactly like people do, these evil creature reside on the Earth exclusively to rob us from what we have the most precious. Because they act so immorally, "simulations" of UFOnauts try to hide from humanity their continuous presence and immoral activity on Earth. But because these UFOnauts need to keep handy their UFO vehicles, while they keep operating on the Earth, they hide these vehicles in various underground chambers and cellars. In turn such large UFO vehicles temporally parked in underground chambers or large cellars, are called "UFO bases". UFOnauts fly to these bases to rest and to get daily orders from their superiors (when e.g. they do not know what to do next). They also frequently abduct people to these underground bases. One such a large underground chamber, in which UFOnauts "park" their UFO vehicles for the duration of operating in Wroc�aw, most probably is located under the "Wzg�rze Partyzant�w". Other site in the vicinity of Wroc�aw, in which, according to a local folklore, also such an underground bases of UFOs supposed to exist, is a nearby mountain called the "G�ra �l�a". There is a curiosity, at which it is worth to direct the attention of the reader at this point. It is that just in the area in Polish Wylatowo, i.e. the place where such crop circles are formed repetitively every year, someone managed to photograph a whole fleet of UFOnauts diving underground head-down. A photograph of this fleet of diving UFOnauts is shown in "Fig. 9b" (and also "Fig. 9c") on a separate web page about aliens. It is worth to see this photograph, because I am ready to bet, that similar photographs are accidentally taken also in Wroc�aw near the Wzg�rze Partyzant�w. Only that because people do not know that such photographs captured a fleets of diving UFOnauts, owners of such photographs most probably thrown them away believing that these are "shaken photographs". Fig. #D6: The so-called "Wzg�rze Partyzant�w" in Wroc�aw (in past called "Bastion Sakwowy" - means "Treasure Fort"). It is under this old fort that according to local folklore entrances to underground tunnels of Wroc�aw survived until present times. These entrances supposed to begin at the metal doors, which on the above photograph are visible on the left side, just under the tree that is captured at the edge of this photo. Notice, that stairs visible above on the right side of the photo, in close up are shown on "Fig. #D21". The curiosity of the above photograph of the fort "Wzg�rze Partyzant�w" is, that in times of my living in Wroc�aw people used to "whisper" about sightings of strange, partially transparent, human-shaped creatures, and also shadows shaped like people which used to fly in the air. How these creatures and shadows used to look like, is well illustrated on the next photograph "Fig. #D7". In medieval times one of the most popular methods of killing people depended on walling them up alive in secluded underground cells, or on throwing them into a tower that had no windows and the only entrance to it was through a small hole in the ceiling. A best example of just such a tower, in which literally hundreds of people died, is the famous "hunger tower" in Paczk�w. (A photograph of this tower is shown in "Fig. 6(b)" from the web page about the town of Milicz.) Paczk�w is a small town in southern Poland, located around 60 kilometres to south from Wroc�aw. This medieval "hunger tower" from Paczk�w remained walled up until mid 1950s, when the local council decided to cut a footpath through it. After the tower was open, it turned out that the entire volume of this tower was occupied by a single cell without windows, which had only a small hole in a high ceiling. This cell was filled up with hundreds of human skeletons, that lied over there in a layer several meters high. It turned out, that medieval rulers of Paczk�w used to throw to this tower by the only window in the ceiling every person who for some reason was disliked by them. In turn after being thrown to this tower, victims simply died out of hunger, thirst, and the lack of light. Of course, other medieval cities were not better at all. For example in undergrounds of the city K�odzko from southern Poland, tourists are able to see an underground prison cell, with a human skeleton. (You can see this cell on "Fig. 5c" from the web page on Milicz.) In this cell someone was imprisoned, and then authorities "forgotten" to feed him or release him. Cells similar to that from the Cathedral in Kwidzy�, the "hunger tower" in Paczk�w, or undergrounds of K�odzko, means designated for burying people alive, existed under the fortified castle in Wroc�aw, and also in undergrounds of the town Milicz. Only that people who died in them never attracted attention of the society. Therefore, now no-one knows about their fate. This photograph illustrates relatively well how these partially transparent human figures, as well as these human shapes flying in the air looked like, that in times of my living in Wroc�aw were seen on the "Wzg�rze Partyzant�w" relatively frequent. Probably they are active over there even today. Only that "modern" people, who today see them, most surely interpret them according to today's intellectual atmosphere - which "condemns" everything that mysterious and "explains" rationally such unexplained facts just as "human imagination". 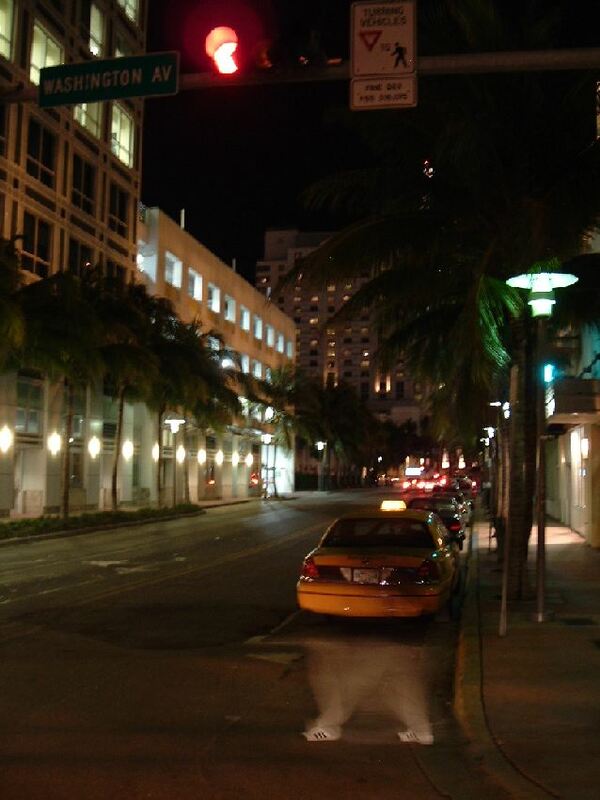 The above photograph was taken by a digital camera in Miami, Florida (USA). The person who took it can be contacted under the email address nes11@op.pl. The photographer claims, that it is impossible that the same frame could be exposed twice. The photograph was taken for the resolution 1MGP and flash switched off. The time of exposure was set automatically by the camera itself - the photographer claims that it could be around 0.5 - 1 seconds. From his experience he also knows that with a longer time of exposure photos taken from "free hand" are clearly moved - the above does not indicate any moving. The taxi visible on the photograph was motionless - next to it were doors to a hotel. The most puzzling in the above photograph is the lack of visibility of the creature captured on it from the belt upward. It is known that one version of the magnetic personal propulsion system used by UFOnauts have propulsors assembled in a belt and epaulettes. This particular version of personal propulsion system could give to a UFOnaut who uses it the invisibility from the belt upwards - for details it is worth to see a description of just such personal propulsion system provided in subsections E2 and R5 from (respectively) volumes 2 and 14 of monograph [1/4], and also briefly summarised on web pages about the village Wszewilki, and about the Oscillatory Chamber. In monograph [1/4], especially in subsection L2 from volume 10, is also explained that UFO vehicles and individual UFOnauts who use magnetic personal propulsion system are able to penetrate through solid objects (such as rocks, soil, walls, windows, furniture, etc.) without doing any damage to themselves nor to these solid objects. (The principle on which this penetration of UFOnauts through solid objects takes place, called the "state of telekinetic flickering", is described on a separate web page about the Concept of Dipolar Gravity.) This means, that entire UFO vehicles, as well as individual UFOnauts, are able to enter undergrounds of the "Wzg�rze Partyzant�w" in Wroc�aw, in order to hide in there from the sight of humans. Other puzzling detail of the above photograph are typical, present shoes, which the photographed creature wears. So if this creature is a UFOnaut, such typical human shoes of the "adidas" type have a value of the evidence, that the intention of this UFOnaut is to mix with people from streets and to look like everyone else. Why these UFOnauts hide from people like bandits, keep secret from people their own cosmic origin, and pretend to be humans from the Earth, all these facts are explained more comprehensively on the web pages evil, changelings, 26th day, and predators available through "Menu 2". Old Wroc�aw had very narrow streets. The city hall of Wroc�aw is one of most elaborate old buildings of this city. Similarly as this was the case in every medieval city, this city hall occupies the middle part of the central square. In turn the central square of Wroc�aw used to be the central area of the whole city, located approximately the same distance from each of four entrance gates to this city. The city of Wroc�aw used to have four fortified gates, directed towards four sides of the world. These gates had names. For example the city gate from the southern direction was called the "Miko�ajska Gate" (i.e. in Polish "Brama Miko�ajska"), in turn the gate from the eastern side was called the "O�awa Gate" (i.e. in Polish "Brama O�awska"). Fig. #D10: A copy (a sculpture) of a lion, which in past used to decorate the top of the fortification by the western gate of the Wroc�aw city. This western gate in past was defended by a kind of two entrance forts, the tops of which were decorated by images of lions. When the fortification walls of Wroc�aw were dismantled, these old lions were left for decoration near the place where they originally used to stand. But with the elapse of time they were replaced by the above more artistic sculptures of lions and Hercules, which decorate until today the vicinity of the place where in past the western gate to the city used to stay. How the original lions from these fortified gates of Wroc�aw used to look like, one can see it today in a nearby town called Milicz. On the southern gate of medieval Milicz, which in past used to be called the "Wroc�aw Gate", in old times an exact replica of these lions from Wroc�aw used to stand. This replica survived until present times. One can see it in the town of Milicz. The photograph of it is shown on "Fig. #D4" from the web site about the village of Wszewilki. Wroc�aw was famous in past from the powerful fortification walls. These walls were constructed from bricks. 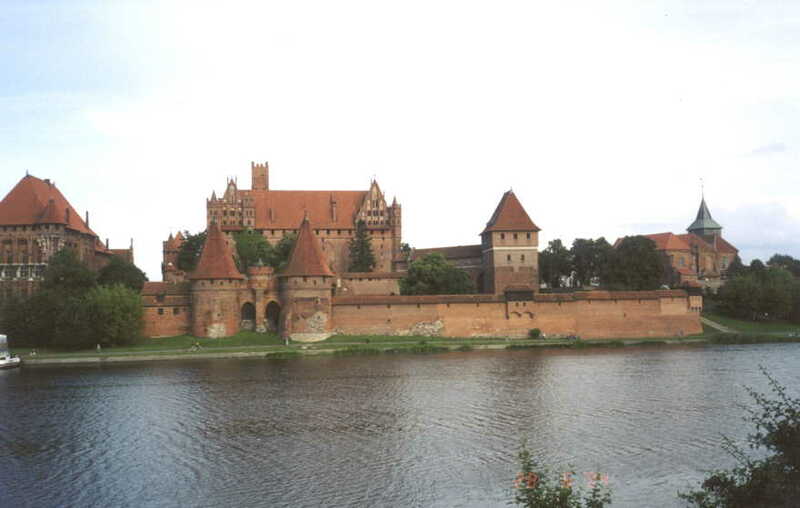 Thus they looked approximately as fortification walls of the castle in the Malbork town shown on the photograph below. Unfortunately, after Napoleon Bonaparte entered (peacefully) Wroc�aw in 1807, he ordered to dismantle these fortification walls. Simultaneously with the walls of Wroc�aw were dismantled fortification walls of a nearby town named Milicz, which (the town) was also occupied at that time by Napoleon's army garrison. More curiosities concerning the fortification walls of Milicz is described on a separate web page about the town of Milicz, and about a nearby village Wszewilki. When Napoleon entered the Wroc�aw city, he called the mayor of this city and asked him to explain "why there were no cannon salutes to greet me?" In reply to this question the mayor of the Wroc�aw city instantly make a long speech addressed to Napoleon. In this speech he pedantically explained 12 vital reasons for which the city did not greet so eminent visitor with cannon salutes. The last out of these 12 vital reasons was "because here in Wroc�aw we do NOT have cannons". Napoleon took to heart this speech, because he suspected that the mayor of Wroc�aw city was scoffing at his "military intelligence" in a highly diplomatic and well hidden manner. So in order to even the score and to show who actually is the boss, Napoleon ordered to dismantle the fortification walls of Wroc�aw, as well as fortification walls of the nearby bishop's town of Milicz. He also left at the Wroc�aw's upkeeping his occupational garrison, supposedly to make sure that the dismantling of the walls was completed thoroughly. But it somehow happened that this garrison was supposedly composed of the greatest drinkers, the most egger womanisers, the most impulsive fighters, and the biggest eaters, from the entire Napoleon's army. Fig. #D11: Here is how most probably fortification walls of Wroc�aw used to look like. These walls were constructed from bricks, although in various areas they contained insertions of rocks and large boulders. They most probably reached the height of around 10 meters. After all, they needed to protect also nearby houses up to the roofs. Every now and again these walls had defence towers embedded into them, similar to towers visible on the above photograph. The above photo illustrates an example of medieval fortification walls from the castle of Teutonic Knights in Malbork. However, the walls of the Wroc�aw city for sure were very similar. Of course, every city has its stories and legends about hidden treasures. Wroc�aw is not an exception in this matter. In times of my youth I heard a lot of such stories. How much they are true, I do not know. However, just in case I repeat here some of them. After all, they represent another curiosity of the folklore from Wroc�aw. The deposit of Wroc�aw Bank. In difficult times of the Second World War, when the bombardments of allies continually threaten every inhabitant of Germany, if someone had anything precious, he or she put this to the governmental bank. After all, then the responsibility for this deposit accepted the government, which promised to protect it with all means available to it. Because Wroc�aw had a significant number of citizens, the local bank accumulated a relatively large deposit of valuables given to it for protection. When in last days of the World War Two this deposit was loaded onto trucks in order to ship it outside of the reach of Russian armies surrounding the city, these valuables filled up several large trucks. What happened to them after they were shipped outside of Wroc�aw, no-one was able to tell for sure (although there were tens of speculations regarding this matter). The treasure from the tower in Strzelin. One day I visited a town Strzelin near Wroc�aw. Accidentally I heard then a story of the local treasure. Soon after the Second World's War, in the middle of Strzelin's central square there was a burned tower. It looked as if it was to collapse at any moment. So no-one had the courage to enter it. But one day a pupil from a local school went to play a truant. In order to hide his presence from these who could recognise him, he entered this tower. Inside he found a room filled up completely with gold and precious stones. When immediately afterwards the government of communistic Poland send trucks to take this treasure, it was so much of it, that it filled up completely several trucks. What happened later with this treasure after it was taken by the government, citizens of Strzelin were unable to tell - there were persisting rumours that it was redirected to private pockets. The question which I always had, was whether this treasure from the tower in Strzelin had been the same treasure which in last days of the war was shipped out from the Bank of Wroc�aw. Fig. #D12: The school from Museum Square. In times before the World War Two, on the place which now is occupied by this school, the former Museum of Wroc�aw used to stand. Wroc�aw is located by the river Odra, which in the area of Wroc�aw splits into many branches, and also have a whole labyrinth of channels for boats. Thus Wroc�aw is famous from the bridges. Actually sometimes it is even called the "Venice of the North", or the "Polish Venice". After all, in the boundaries of it there are 12 islands on the Odra river, and 112 bridges. The vicinity of Wroc�aw was an arena for numerous battles in the history of Poland and this province. Probably the largest out of these was the battle on a nearby "Psie Pole" (meaning "Dog's Field" - named so because there was so many dead soldiers that there was not enough local workforce to burry them all, so dogs ate some of bodies). Presently the area of this former battlefield is one of suburbs of Wroc�aw. Wroc�aw has many of old cemeteries. The most meaningful out of these is the cemetery of Russian soldiers. They died so that Wroc�aw could become what it is now. I wonder how many of us remembers about this fact, is aware what and where would be if not the death of these (and others similar to them) soldiers, and shows a gratefulness to these fighters for our freedom by placing sometimes a symbolic flower on the graves of some of them, or saying a prayer for their intention. We must remember, that none of these soldiers had a choice neither where and when was born, nor who was to be the leader of his country, nor where and when he comes to die. Each one of us could, and still can, find himself or herself in their position. Fig. #D15: The cemetery of Russian soldiers from Wroc�aw. Thousands of these soldiers were killed during the liberation of Wroc�aw. The most shocking in interiors of old churches (including churches of Wroc�aw) is that everything contained in them has also shapes which exactly reflect these three possible shapes of Oscillatory Chambers of UFOs. Thus in old churches most frequently everything becomes a column that has an octagonal cross-section - as an example see the object shown in the photograph from "Fig. #D16". Actually, in the majority of churches aged over 500 years, even columns have the eight-sided cross-section - for an example of such octagonal columns in an old church see the photograph on "Fig. D19" from web page about the town of Milicz. Furthermore, in everything contained in these old churches such an octagonal cross-section is only appearing in the horizontal plane - means exactly in the same plane of cross section, in which Oscillatory Chambers from UFOs are octagonal. If something is not octagonal, then in horizontal cross section it has either a square shape, or a sixteen-sided shape (or is round - as round is a rough approximation of sixteen-sided figures). In turn, it is almost impossible to find in old churches anything that would have a triangular, or six-sided cross-section, in spite that such shapes would be incomparably easier to make with tools of old masters, than eight-sided or square cross-sections. Thus, the extremely shocking attribute of old churches is that in their interiors almost everything imitates the general shapes of Oscillatory Chambers from UFOs. Fig. #D16: An eight-sided stony font (i.e. baptism dish) from the church of Virgin Mary on Piasek in Wroc�aw. (The photograph taken in 2004.) Such eight-sided fonts (i.e. baptism dishes) imitate the most important propelling devices from UFO vehicles of the second generation (called also telekinetic vehicles), means their eight-sided "Oscillatory Chambers". Stony fonts (baptism dishes) of a similar shape can be found in practically almost every old church from Wroc�aw. Most of these are in old churches from the "Ostr�w Tumski" in Wroc�aw (e.g. see a similar eight-sided stony font from the Cathedral of St. Maria Magdalena). The reason for which Christianity adopted eight-sided shape of Oscillatory Chambers of the second generation for these containers with holy water, is the dense telekinetic field which these chambers generate in UFO vehicles. Such a telekinetic field is a technical version of the same healing telekinetic field which in a natural manner is generated by human healers during healing sessions. In fact, according to reports of present people abducted to UFOs, UFOnauts sometimes organise a kind of "bathing" in this dense telekinetic field generated by Oscillatory Chambers of their UFO vehicles of the third generation. For people who participate in such "bathing", this field feels almost like a kind of dense "liquid" in which one can even swim. Such "bathing" in this telekinetic field have the ability to almost instantaneously heal wounds and to cure all health problems in the bathing people. Therefore for old inhabitants of the Earth, this invisible "liquid" (i.e. telekinetic field) which was emitted from such eight-sided Oscillatory Chambers of UFO vehicles displayed holy attributes equal to these from holy water. This most probably was the reason why eight-sided objects similar to outlines of such octagonal Oscillatory Chambers from UFOs were used in churches as containers (fonts) for holy water. In times when people still were passionate about UFO research, while I still lived in Wroc�aw, this city was a centre of quite an intense activity of UFOs and UFOnauts. UFO sightings were so numerous at that time, that research of these sightings provided occupation to a large and highly active UFO organisation of Wroc�aw. This organisation existed and actively worked already in years 1980 to 1982 when I joined actively its ranks. It existed also and worked actively after my emigration to New Zealand. As I described this in item #D7 of this web page, Wroc�aw probably has its own UFO underground basis. This basis most probably is located under the Wzg�rze Partyzant�w. Probably it is the reason and the source of such high UFO activity in Wroc�aw. Furthermore, according to legends, the nearby mountain called "G�ra �l�a" not far from Wroc�aw also has inside a similar underground chamber in which continually hides at least one UFO vehicle. Means that the G�ra �l�a probably hides another UFO base located not far from Wroc�aw. (Folklore states that in Poland similar underground UFO bases exist also under the castle of Teutonic Knights in Malbork, in "Babia G�ra", and in "�ysa G�ra" - all this is explained more exactly in treatise [4b] (which is available only in the Polish language). Fig. #D17: The illustration of the UFO vehicle type K3 which in 1978 landed in the "Szczytnicki Park" from Wroc�aw. This illustration was drawn by a 9-years old boy who witnessed the landing. 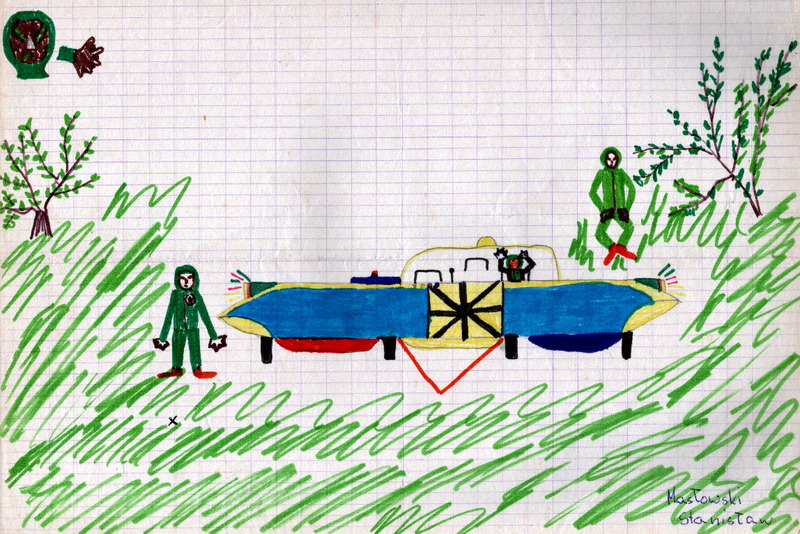 This original drawing illustrates how in eyes of the 9-years old boy a UFO vehicle looked like, which landed in the Szczytnicki Park of Wroc�aw. Descriptions of the close encounter with this UFO vehicle of K3 type, and with its crew of three small humanoids, is presented in subsection R1 from volume 15 of monograph [1/5]. (In monograph [1/5] the above drawing is shown and described as "Figure R1".) Please notice that the actual appearance of this UFO vehicle type K3 (the shape of which was verified with the author of the above drawing by showing to him a model of the vehicle of such a shape) is shown as illustrations "Fig. C1(b)" and "Fig. G20" from web pages about Magnocrafts and about Oscillatory Chambers. On 4 September 1979, around 9:30 am, a UFOnaut wearing telekinetic personal propulsion system patrolled a flat in Wroc�aw. After walking along the floor of this flat which was covered with PVC tails, this UFOnaut left behind 17 stepping marks. The average distance between subsequent of these marks was around 40 cm. These marks were subsequently researched by scientists from the Institute of Inorganic Chemistry at the Technical University of Wroc�aw. 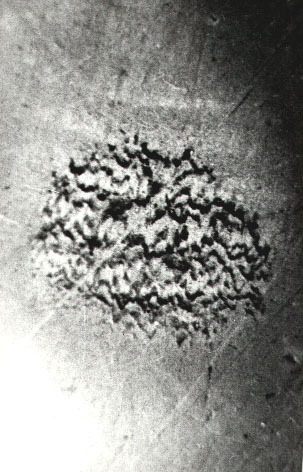 A complete report from this research, as well as the detailed description of circumstances, place and time in which these marks were made by a UFOnaut, are provided in subsection R3 from volume 15 of monograph [1/5] - available free of charge from this web page via "Menu 1" and "Menu 4". Fig. #D18: Here is a photograph of a scorching patch from the walking trail of a UFOnaut shoe imprints, which in 1979 were left on PVC tails of one flat from Wroc�aw. The curious aspect of Wroc�aw was, that in past it also had symbols that defined its polarity. These symbols seems to continue their action until today. Fig. #D19: On the foreground a sculpture of a frog (the first one, out of two) which is placed by the fountain on zero level of the most popular (in 2004) supermarket of Wroc�aw, called the "Galeria Dominika�ska" (another frog is visible on the opposite side of this fountain - but only after the viewer clicks on this photo to enlarge it). The photograph taken in July 2004. Please notice, that frogs have a special symbolism in Chinese "Feng Schui", as a symbol of influence and prosperity. Thus sculptures of frogs are frequently one amongst two symbols which designate the polarity of a given settlement or institution. For example, they definitively assist in attracting clients to the "Galeria Dominika�ska" in Wroc�aw. Medieval Wroc�aw was also constructed with symbols of just such a polarity, only that they defined the expansion of this polarisation in the direction from east to west. Wroc�aw has a lot to offer to tourists and visitors. Independently from what offer almost all Polish cities, i.e. tasty food and a large selection of drinks, Wroc�aw offers also its unique atmosphere, architecture which links all styles of recent 1000 years, extraordinary history, taste of mystery, a wide range of events and cultural services, numerous museums, and many other goodies. Furthermore, it lies on the crossing of an entire range of vital trails and highways, has a good external and internal communication, is easy for sightseeing, lies on a flat land preferred by tourist, is close to practically every interesting area in south-west Poland, and is still reasonably safe. The only thing which still requires polishing, is the availability of inexpensive and simultaneously comfortable, one or two bed hotel rooms, situated conveniently in the centre of city. To the attractions of Wroc�aw which are the most fascinating for me, belong numerous very old churches. These churches originate from practically every period and architectural style of recent 1000 years. They offer a perfect insight into furnishing of interiors in subsequent epochs. Independently from churches, in Wroc�aw fascinating are also numerous parks, large ZOO, variety of countless bridges through the Odra river and its channels, medieval architecture of the vicinity of central square, and also numerous supermarkets and modern trade centres full of goods which are able to satisfy even the most refined taste. Fig. #D20: The exhibition rotunda with the extraordinary painting called the "Panorama Rac�awicka". This is a purpose build rotunda, designed in such a manner that it is able to host a gigantic, because of dimensions 120 m x 15 m, panoramic painting of Polish painters named Jan Styka i Wojciech Kossak. This painting presents the battle under Rac�awice, which took place on 4th April 1794. In this battle Polish uprising forces commended by the General Tadeusz Ko�ciuszko accomplished a great victory over the Russian army. This extraordinary painting is so designed, that it has a form of a ring that surrounds people who look at it from all sides. Therefore parts of the battle can be viewed on it in all directions, i.e. throughout the entire angle of 180 degrees. Such a painting is unique on the world's scale and in fact it is worth to be seen. Unfortunately, each time when I was in Poland, and when I tried to see it, it turned out that the limit of visitors for a given day was already exhausted and thus there is no ticked for myself. In the result I saw myself only parts of this famous painting published in various places, but never managed to see the entire original painting. A long ago, because in years 1966 and 1967, in the month of May, Wroc�aw celebrated students' Juvenilia. It was a day when students took keys to the city. It was also a day of the biggest festival of Wroc�aw, to the scale and vitality of which no other festival could compare or oven get close. After all, in spite that this festival was organised by students, the spreading and vitality of it caused that it involved into fun practically all people living in this city. Unfortunately, the Juvenilia of Wroc�aw in their first issue had a serious enemy. It was the authorities of Wroc�aw from that time, which reluctantly observed the growing political influence of student organisations. Thus, when during the second Juvenilia in May 1967, a tragic collapse of stairs took lace at the "Wzg�rze Partyzant�w" (see the photo from "Fig. #D21"), these authorities utilised the tragic opportunity to forbid further organising of Juvenilia in Wroc�aw. Thus this historically first Juvenilia of Wroc�aw were organised only twice, i.e. in years 1966 and 1967. This old law forbidding to organise Juvenilia was in power in Wroc�aw almost for a half of century. From the information which reached me in New Zealand it appears that it was withdrawn only in 2003. So starting from 2003, Wroc�aw again has the most important festival, means the vigorous student Juvenilia. Fig. #D21: The deadly stairs on the so-called "Wzg�rze Partyzant�w". (See also "Fig. #D6".) It was just on these stairs that in May 1967 a tragic accident took place. This accident was used to abolish the organising of Juvenilia in Wroc�aw for almost a half of century. Under the weight of youth that was climbing then these stairs, the stairs collapsed, killing and injuring a number of people. Because authorities of Wroc�aw of that period, felt threaten by the growing political power of students, they immediately used an excuse of this collapsing in order to forbid the organising of any further Juvenilia in Wroc�aw. As I have heard, only in 2003 Wroc�aw overcome this old law and again started to organise Juvenilia in May. Every event or object can be interpreted from two different approaches, or different "points of view". Philosophers call these approaches (1) "a priori" means "from the cause to effects", and (2) "a posteriori" means "from the effect to a cause". In item #A2.6 of the web page named totalizm.htm, and also in item #C1 of the web page named telekinetics.htm, it is explained on empirical examples, that 'only the interpretation of every event or object from both these approaches, i.e. from "a priori" approach and additionally also from "a posteriori" approach, allows us to learn the entire truth on the subject of this event or object'. Unfortunately, so far the so-called "atheistic orthodox science" - means the official human science practiced on present universities and described more thoroughly in item #F1 of the web page named god_exists.htm, uses only a single approach, namely "a posteriori" one. For the use of "a priori" approach it has NO courage. After all, this would require to acknowledge that there is a superior "cause" for all events and objects, means that God does exist. On the other hand - as it is explained more comprehensively in abovementioned item #F1 from the web page named god_exists.htm, the negation of the God's existence is written into the philosophical and scientific foundations of the "atheistic orthodox science" to date because of the adoption by this science of the so-called "Occam�s razor" for the most vital "founding assumption". Fortunately, in 1985 was developed an extraordinary scientific theory called the Concept of Dipolar Gravity, from which emerged also the most moral and progressive (as for present deviated ages) the so-called philosophy of totalizm. In turn that theory and philosophy created scientific and philosophical foundations for a completely new kind of science called the "totaliztic science". In turn the newly emerging "totaliztic science" researches the surrounding reality from the most general "a priori" approach, namely from the approach "from God to the reality which surrounds us". The newly emerging "totaliztic science" interprets everything from our surroundings on a completely different manner than this is done by the old "atheistic orthodox science". In this way it supplies to us the "so-far missing second half of truth" - as this missing "second half of truth" is defined in item #A2.6 from the web page named totalizm.htm and in item #C1 from the web page named telekinetics.htm. So in order to illustrate here to the reader, how that new "totaliztic science" interpreters some events on the Earth, below I am going to discuss an example of interpretation carried out from "a priori" approach, for a quite vital in present times events occurring also in Wroc�aw, namely for "cataclysms". Of course, the following interpretation of cataclysms for the city of Wroc�aw, remains also valid for all other cities of the world, to situations of which it can easily be extrapolated. 1. The illustration of links between the "morality" and practically everything that surrounds us. In order to realise, how every event and every object illustrates these links (also, how these links are illustrated by all events and all objects described on this web page), I am "challenging here the reader", to find such links in every matter described on this web page. After all, if the reader discovers and confirms for himself or herself that such links really do exist in every matter concerning the city of Wroc�aw, then he or she starts to understand and appreciate them also in other cities and other regions of the world. 2. The revealing that so-called "group morality" of the inhabitants living in subsequent cities and regions, decides about everything that affects these cities and regions, including cataclysms that hit them. For example, when analysing only the fate of Wroc�aw, the reader also has a chance to understand the link between the "group morality" of inhabitants of e.g. capitol of Haiti or the New Zealand city of Christchurch, and the destruction of these cities with earthquakes described in items #C3 and #C5 to #C6 from the web page named seismograph.htm. The reader can also understand for example how the "group morality" of Japanese people influenced the recent explosion of nuclear reactors in Japan - as this is explained, amongst others, in items #M1 to #M1.3 of the web page telekinetics.htm. 5. The realising that Wroc�aw already received a "warning" about an impending cataclysm, and that this city is "NOT protected" from cataclysms. The majority of large cities in Poland are protected from cataclysms because they are inhabited by these at least "10 righteous". But from the extrapolation to the situation of Wroc�aw events from other cities of the world, described in item #B1 of that web page, it seems to appear, that the city of Wroc�aw most clearly is NOT protected from cataclysms. After all, relatively recent in short time spans it was hit by two "cataclysmic floods" and by a tornado described in item #H3 of the web page named tornado.htm. All of these carried all attributes of "warnings". In turn, just such "warnings" carry in themselves several messages simultaneously. For example, they state that "a cataclysm is coming soon", and also that "your city or region is NOT protected from cataclysms". Furthermore, their major message is the command "there is about the time that you change your habits, ways, and philosophy, because if you do NOT embrace such a change, then these alterations will be imposed on you through a cataclysm". 6. The learning how entire Wroc�aw can defend itself against the arrival of the killer "urging cataclysm". If two last "cataclysmic floods" in Wroc�aw are interpreted as "warning cataclysms", then a next cataclysm would already be this killer "urging cataclysm" (unless God decides that the "warning" should be repeated once again). In turn, such an "urging cataclysm" can flatten to the ground even a half of city, and take life of a lot of people. Therefore, in the interest of the city of Wroc�aw lies now to document clearly (i.e. to document equally unambiguously as it is illustrated in the Biblical example of the city of Nineveh described in the "Book of Jonah" from the Bible, verses 3:7-10), that in Wroc�aw took place a significant change of the "group philosophy". Of course, the biblical example on how to convince God that such a change of philosophy actually did take place already, is slightly out of date and I am ready to bet that in present times there is NO such a city on the Earth which would be ready to repeat it even under the threat of an "annihilating cataclysm". Fortunately, the academic character of Wroc�aw and the fact that I originate from Wroc�aw, taken together indicate a rather simple manner on which this city can document a change of philosophy, but simultaneously "keep the face". Namely, according to findings of the philosophy of totalizm, the proof of the change of a "group philosophy" of Wroc�aw, which would suffice to call off an impending cataclysm, would be if universities of that academic city would become the first in the world which would formally adopt "totaliztic sciences" through the official inclusion of the lecturing of the Concept of Dipolar Gravity and the philosophy of totalizm to programs of their studies, and through official implementing in research the philosophical approach called "a priori", means the scientific approach "from God to the reality around us" - as this approach "a priori" is explained in item #A2.6 of the web page named totalizm.htm and in item #C1 of the web page named telekinetics.htm. After all, both the Concept of Dipolar Gravity and the philosophy of totalizm originate from the scientific tradition of the "totaliztic Wroc�aw" (as this city used to be in past), in turn that fact just by itself is a sufficient reason that these newly emerging "totaliztic sciences" were officially lectured at universities from Wroc�aw. Of course, by being the simplest one, the most honourable, and the most easy to implement manner of convincing that Wroc�aw returned on the path to become again a "totaliztic city", the above manner is NOT the only one that could be implemented in there. Out of the entire range of other existing manners, probably an almost similarly easy one would be if "the city funds a stipend to an active totalizt", as described in item #C5.1 of the web page named seismograph.htm. 7. The learning how "composite intellects" of Wroc�aw also can defend individually from the arrival of killer "urging cataclysm". Wroc�aw as a whole is a huge "group intellect" which is composed from a number of smaller "composite intellects" - such as individual universities, factories, institutions, churches, organisations, families, individual persons, etc. So if the city of Wroc�aw treated as a whole large "group intellect", decides to NOT undertake prevention measures that would stop impending cataclysms (i.e. if it does NOT defend itself from cataclysms), then this should NOT stop these "composite intellects" of Wroc�aw from individual undertaking prevention measures and self-defence. After all, if one analyses cataclysms from "a priori" scientific approach, then it turns out that even when a given large "group intellect" is treated to some destructive cataclysm, still various amongst its "composite intellects" are "saved" from experiencing the consequences of such a cataclysm - of course if on everyday bases they practice a sufficiently "totaliztic" philosophy (i.e. if they act "sufficiently morally"). The most clearly such "saving of 'composite intellects' from fury of cataclysms" is visible on religious objects (e.g. on churches, crosses, temples, mosques, etc.) which - if they only do NOT practice in a give area something that God disapproves, remain untouched even if everything around them is destroyed - for documentation on this fact see items #B2, #C3 to (5) in #C5 and #C6 on the web page named seismograph.htm and also item #H4 on the web page named landslips.htm. In turn undertaking such an individual defence against cataclysms by these "composite intellects" of Wroc�aw is easy. After all, for that purpose it suffices to demonstrate to God that on everyday basis they pedantically practice the highly moral philosophy of totalizm - as this is explained in more details, amongst others, in item #B6 of the web page seismograph.htm. For example, in case of individual people it suffices to start practicing the so-called formal totalizm - means the "formal version" of the philosophy of totalizm. In turn group intellects must demonstrate that they also embraced this philosophy - e.g. individual universities still can independently from Wroc�aw implement for their students the lecturing of the Concept of Dipolar Gravity and the philosophy of totalizm, while factories, institutions and organisations can begin to sponsor somehow this philosophy - e.g. through an open announcements to their crews that they adopted totalizm for the official philosophy of their institutions, etc. 8. The realising, that it is also worth to watch carefully further fates of Wroc�aw. Although everything that is explained in the above items results from my personal worry about the fate of city which is so-close to my heart, linked to the logical extrapolation to Wroc�aw of regularities that ruled over events in other cities of the world, I am sufficiently familiar with principles of operation of present decision makers, to be almost sure in advance, that Wroc�aw treated as a single whole "group intellect" probably is to ignore everything that is explained here. This is because similar ignoring already took place in the case of the city of Christchurch from New Zealand - to which also a significant time in advance before the "urging cataclysm" I explained with the use of item #C5.1 from the web page named seismograph.htm, what that city should do to hold back further earthquakes. But Christchurch have chosen to ignore my advices, while in slightly more than a month of time afterwards it was almost completely destroyed. Therefore, herewith I am advising the reader to begin a careful watch of the further fate of Wroc�aw, because the logic is whispering to us, that after some time, with that city is going to begin happening something really worth noticing. The philosophy of totalizm teaches, that in order to increase the knowledge more effectively, and also in order to challenge Himself to find solutions with the highest possible level of difficulty, God created people as imperfect as it only was possible (for more information on the subject of imperfections "in-build" into people on the stage of creation, see subsections A7 and A3.1 from volume 1 of my newest monograph [1/5]). But in the result of these in-build imperfections people love to commit to other people various harms, cheating, exploitation, injustice, tortures, etc. So in order to have also an effective mechanism that "teaches" people to behave themselves, God created a kind of algorithm or program, which in the Eastern religions is called "karma". This "karma" causes, that "all feelings that someone induced in others through doing bad of good deeds to them, after some time are also induced in this someone". Karma works in equally automatic and unavoidable manner on all intellects, i.e. equally well on the so-called "individual intellects" (means on single people), as on the so-called "group intellects" (means e.g. on the entire institutions, cities, countries, nations, etc.). Thus, if any city, e.g. Wroc�aw, accumulates too much "bad karma" caused due to someone's pain, suffering, tormenting, injustice, etc., then the "return of that karma", which must one day come, also brings similar consequences, i.e. also brings pain, suffering, tormenting, injustice, etc. IN case of "group intellects", one amongst manners on which the returns of such "bad karma" can be carried out, is to bring a destructive cataclysm on that intellect, which in turn induces pain, suffering, tormenting, injustice, etc., e.g. to bring such a "cataclysm" as the one described in item #E2 above. Unfortunately, it so happens that Wroc�aw accumulated a significant amount of such a "bad karma", the return of which may boil down to bringing of some powerful "cataclysm". Because usually if something is NOT documented thoroughly, then people treat it as "non-existing", in items that are to follow below I am going to gradually describe and document these cases of "bad karma" accumulated by the city of Wroc�aw (treated as an entire "group intellect"), about the appearance of which I still remember from times when I lived in that city. In turn these cases, and many more similar to these - which I am not able to describe here because of the lack of access to data on them, should realise to everyone that about the time to begin take notice of the moral significance of our actions. After all, after God finishes with all other more "urgent" cities, which also accumulated a lot of "bad karma" but ignored the effort to neutralise or to repair it, one day a turn will come to "correct the morality" of the city of Wroc�aw - through sending a "cataclysm" on it. In turn, when this time will come, inhabitants of that city (and also outside witnesses of its fate) at least will know well for what they get the hit, and will be able to draw correct conclusions from own experiences. In May 1968 authorities of Wroc�aw of that time carried out a "purge" amongst students of the Technical University of Wroc�aw. This "purge" boiled down to a highly unjust and hurting removal from the university around 40 exceptional students. In spite that the removal of these students contributed later to origins of the "Solidarity" movement, and to the change of ideology of the entire Poland, victims of that removal never were rehabilitated, while the injustice and harm committed on them was never repaired. So the "karma" for removal of these students until today is "charging the conscience of the entire city of Wroc�aw", and thus one day this city needs to pay the karma back. Below I am going to quote the so-called "personal history" of this removal - as I remember it and thoroughly recorded, adopted from subsection A18 in volume 1 of my newest monograph [1/5]. (What exactly is such a "personal history", is explained in more details and on another historical example, in items #B2 and #C1 from the web page named bitwa_o_milicz_uk.htm.) As I always try do, also into the "history" below I inserted the explanation resulting from findings of the philosophy of totalizm, which reveals how the city of Wroc�aw, as a "group intellect" can "compensate" that old injustice and harm, and thus can neutralise and repair the "bad karma" that it generated for itself through that event. On 1st of May 1968 a kind of "miracle" saved me from being removed from the university. (As I explained in item #F3 from my web page named wszewilki_uk.htm on examples of a number of miracles which I experienced personally in my life, the reason for the occurrence of that miracle was to provide me with another experience for hardening my character and for training me into a soldier, accordingly to quite unpleasant for us method of upbringing called the "principle of reversals".) For the fact, that it truly was a "miracle", not just an ordinary "coincidence", certifies the logical deduction, that if that removal from the university actually did happen at that time, then in my adult life I would NOT be able to develop scientifically my theories, discoveries, inventions, etc. Thus, together with an array of other similar events, a part of which I described in previous paragraphs of subsection A18 from the monograph [1/5], while others I described in item #H2 of the web page named god_proof.htm, the "miracle" discussed here suggests, that since the youngest years I was under a kind of "superior protection" which make sure that I did NOT deviate from the path that was destined for me. The entire course of events which led to that "miracle" of the 1st of May 1968 is extremely entangled, unclear, and for a single researcher probably now almost impossible to work out for bringing to the public knowledge the complete truth about what has happened then. After all, events from that time were intentionally camouflaged so that on the society they could make an impression that "they are something completely different than they really were". An excellent illustration of just such intentional camouflaging that historical events is the content of book by two Polish history researchers, i.e. by S. Cenckiewicz and P. Gontarczyk, entitled "The Secret Police and Lech Wa��sa" (2008, 780 pages) - to which in New Zealand referred the article entitled "Walesa fingered as a communist spy", from page A20 of newspaper The New Zealand Herald, issue dated on Thursday, June 26, 2008. Therefore, in order to really learn the truth about these events, it is necessary to establish an organised action of some larger group of people, e.g. still living students who in that political "purge" were removed from the Technical University of Wroc�aw, or descendants of these students. After all, such an organised group could benefit from legal tools of the kind of "Freedom of Information Act", to gain access due to these tools, to information stored in archives of police, army, and (of course) the Technical University of Wroc�aw regarding these events. After all, for the scientific exactitude and for a historical truth it would be worth to clarify these events, because in fact these were the first in Poland, and as such they provided the initiation of the "snowball effect" which rolled by the strive of Polish nation to freedom and to other human rights, with the elapse of time grew to a huge avalanche which blown from the surface of the Earth the dictatorial government and ideology of that time. So in order to add my own contribution to these future efforts of thorough learning about these events, and also in the name of truth and historical accuracy, herewith I am describing how I remember and understand the course of these events - although I am aware that some facts I could understand or remember wrongly. So here is my report from that "political provocation" and "purge", written down to illustrate how these events looked like from my personal prospective of their participant and "eye witness". In times when I studied, students of the Technical University of Wroc�aw started to play an ever increasing and active role in pressures on the political renewal of the country. In fact, these were student demonstrations and occupational strikes on our university (described, amongst others, in subsection JE4 from monograph [1/5] and also in item #C3 of the web page named nirvana.htm) that initiated then a kind of political avalanche which with the elapse of time led to the assuming power by a different leader, and later led also to the eventuation of "Solidarity" and to the abolishing of communism in Poland. No wonder that the political police of that time was NOT impressed by the growing political activities of students from our university. Thus, most clearly the police received and order "from top authorities" to organise a "purge" - means to remove from the university all students that documented somehow that they are politically active. Of course, in order to be able to remove someone from the university, one needs an excuse and also "evidence" of "inappropriate" behaviours of that someone. So in order to fabricate such an excuse and to document the required evidence, decision-makers of that time designed a cunning political provocation, which was to be implemented during the march on the occasion of 1st of May 1968. From the course of that provocation stems that the project of it was thoroughly designed by political experts and psychologists, and that it clearly was composed of several stages. Although about the possible project of it at present we can only speculate, from the course of events it stems that most probably these stages included, amongst others: (1) the announcing amongst students of the Technical University of Wroc�aw, that political authorities of the university and city of Wroc�aw do NOT want participation of students in that particular 1st of May parade - thus, on the principle of "method of persuading a donkey", this announcement supposed to cause that all politically-active students for sure are going to go for that fatal parade, (2) mixing a "ruffian team" of around 100 young policemen in civil clothing into the marching column of students from the Technical University of Wroc�aw, so that policemen could parade together with these students in front of the honorary grandstand with city VIPs and officials, (3) starting "provocation and unrests" by these policemen in plain clothes at the moment when the column of students (mixed with policemen) arrives in front of grandstand (i.e. these policemen surrounded our students and started the trained in advance yelling rude words, showing political banners, throwing tomatoes and eggs on the grandstand, whistling, pretending that they try to run onto the grandstand, etc.) - so that another group of police, also in civil clothing, which "awaited" already on the grandstand and around it with "ready to shoot" photo-cameras, could document on photographs that these were our students who stirred the unrests, (4) immediately after the parade identification from photographs, removing from the university, and forcefully enlisted to army all students from our university who had a bad luck to take part in that march. However, unfortunately for that perfectly designed "political provocation", into the implementation of it creep in a serious imperfection, which with the elapse of time probably turned out to be the cause which later cost communists the loss of power. Namely, the first and highly vital stage (1) of "agitation", which supposed to convince students that "authorities of the university supposedly do NOT want participation of the students in that particular parade", was intercepted and "changed" by student unions from that times - which transformed it into an "appeal of patriotism and saving the honour of the university". Thus, quite a miserable "agitation" from police that commanded to students "go to this parade because the authorities do NOT want you to go", was silenced by students' radio and activists with much lauder appeals ordering "go to this parade if you are a patriot, because a year earlier almost no-one went, thus the honour and prestige of our university was seriously tarnished". In the result of that loud appeals by student unions which silenced that police "agitation", for that tragic parade from 1st of May 1968 went almost exclusively students of our university, who belonged to the kind that if they see e.g. a victim of accident on the street, then they would run to save him or her - instead of passively watching as he or she bleeds to death (i.e. to the parade went mainly loyal towards the university students with daring and active stand towards the life, who felt patriots and for whom the honour of the university was vary vital, but who did NOT belong to the group that was politically active). In turn these politically active students at which the "purge" was aimed, completely ignored that march - after all for them the honour of the university and patriotism were NOT factors that motivated their actions. Thus the outcome of that imperfection in the implementation of that provocation and purge was, that when after the 1st May parade discussed here removed were from the university all students who took part in it, in fact instead of eliminating politically most active students, the police removed from the university only these most loyal towards it and Poland, most patriotic, honourable, moral and disciplined students. In turn, these politically-active students still remained at the university and still organised activities which with the elapse of time turned out to be instrumental in the initiation of the avalanche of political changes and in the fall-down of communism in Poland. The assembly area for students of our university was in a side street near the main railway station of Wroc�aw. I come as one of the first students, so I took place in one of the first "march four abreast" in our marching column, on the right side, so that later I was marching just by the footpath and was visible from a distance. Apart from myself, to that parade arrived, approximately around 40 students from our university, because all together we formed a marching column similar in size to a single platoon of Polish army. I was knowing faces of almost all arriving students, because as a long-term activist in the university's "Canteen Committee" I was placed on duty in almost all canteens from our university. In turn because I had a relatively good memory for faces, from the appearance I used to know the majority of students who used to eat meals in these canteens (unfortunately I have a bad memory to names, so I do NOT remember any name of these our colleagues). Several students brought banners with patriotic content, of which fact I am sure as one person in civil clothing (probably a policeman) ordered them to unwind these and to show what they say. All banners that they brought stated exclusively something patriotic, along the line "long-life to the 1st of May". When the parade started, soon from a side street we marched into the main path for the parade, along the �wierczewski Street - near the end of which was located the grandstand with VIPs and city authorities. On that main street something very strange started to happen. Namely, from the crowd of onlookers which crowded both sides of the street, small groups of civil "youth" in our age level started to emerge, and they joined to the end of our column of marching students, merging with it into a single unit. In that particular parade every organisation and every institution was forming a separate marching team, thus our group being joined by these athletically-build new participants was NOT an accident or a mistake. Clearly, similarly to us, they were quite familiar with the military drill and discipline, because they marched equally to us disciplined, in the same as us rhythm and right "step" - i.e. they and us marched as if it was a single column of well trained army. Because they joined the back of our column when we already were busy with marching and forced to maintain the "tetrad" formation, there was no opportunity to ask who they are, whom they represent, nor why they joined our students' column. I myself many times looked back at them, because knowing faces of the majority of students from our university, I was unable to recognise any of them. Thus, it make me curious who they are, as I was absolutely sure that they are NOT students from our university, and probably NOT students at all. I was fascinated by expressions on their faces, because they all had the same expression as if a tension, scare, danger and determination. In past, together with many other people, I saw how on the dam from the river Barycz near the town of Milicz, a raging water torrent captured and tried to drawn a young man, while for a long time failed all attempts of people gathered on shores to save him. So when that raging torrent was sucking him down and throwing him up, he had just the same expression on the face as members of these athletic "reinforcements" that joined our marching column. There was much more of them than us. I approximately estimate their number at over two platoons - i.e. over 100 persons. So rhythmically and in silence we marched towards the grandstand like an army column. When we started to see already the grandstand distant from us by not more than around 100 metres, in the first row of crowds standing on footpaths to watch our parade, I noted my girlfriend of that time. She also saw me - after all I marched just in front of her nose. So she called me to join her. Because the girlfriend was at that time more important for me than the parade, I abandoned the further march and joined her. Together we immediately left the parade and went to the central city square of Wroc�aw where was happening something that interested us. So I did NOT saw what has happened next. Only from stories told later I realised, that when the column of my colleagues together with these athletic "reinforcements" arrived to the grandstand, an "unrest" has started. As I believe, this "unrest" was initiated, escalated, and carried out exclusively by members of these "reinforcements", not by our students. After all, these "reinforcements" probably joined our column just for that purpose, so that the authorities could gain evidential photographs. Also probably they surrounded our students - so that on photographs it could look as if these were our students that caused the "unrest". This is why all colleagues who marched in this parade could be immediately afterwards officially removed from the university and forcefully incorporated into the army. In this way the university has lost the most loyal, patriotic, honourable, moral and disciplined students. With that highly unjust removal of these patriotic students from the Technical University of Wroc�aw, is linked the matter of historic "justice". In my opinion, the university has now the duty to somehow rehabilitate and reward each one of them. Therefore, as I explained this in item #E5 from my web page about graduates of the Technical University of Wroc�aw, herewith I propose, that in the name of historical justice, the Technical University of Wroc�aw finds them all, then to each one of them awards the honorary Polish title of the "magister in�ynier honoris causa" - i.e. the title that would morally compensate to them for the one which they were deprived then unjustly. In turn, if any amongst them is NOT alive anymore, then the title should be granted to him posthumously. The granting to them such titles in fact would also turn to be highly beneficial to the Technical University of Wroc�aw itself. After all, for that university this would be an excellent "Public Relations" (PR) move. The fame of this highly right and just move would spread along the entire Poland, and perhaps even throughout the entire world. I do NOT need to explain here, that the moral knowledge which I am accumulating and disseminating via my publications and the philosophy of totalizm, would hugely benefit if it would be possible to learn further fates of at least some amongst these students so unjustly removed from the Technical University of Wroc�aw. Therefore, if by any chance the reader of these words is one amongst these students, or is a descendant of him, or his friend or acquaintance, then I would be very grateful for contacting me. Equally precious would be if I could be contacted by any amongst members of these "reinforcements" which at that parade joined our column - after all, due to internet if they want they could maintain anonymity while exchanging the information with me. My contact details are always provided on the title page of each volume of my monographs, and also at the end of each my web page. Every city is like a cube - means can be viewed from several sides. Described above is one such side described for the old city of Wroc�aw. In order to see how the updates of this web page on Wroc�aw are going to progress further, it is worth to revisit it from time to time. From the definition this web page is going to be subjected to further improvements and extensions, as soon as possible new information come to my hands, or some events take place which will inspire me for carrying out the update. So if in the future you wish to learn these news, then perhaps you should revisit this web page. This is because I am going to update it periodically, as soon as the further developments give reasons for reporting some further news. Copyrights � 2013 by Dr Jan Pajak. All rights reserved. On several my web pages, including also this one, photographs are presented which have a sentimental value for me. Although I am happy to show these photographs for interested people, I would not like someone copies them to disseminate them further. Therefore herewith I clarify, that for all photographs presented on this web page, the copyright holder is me, means Dr Jan Paj�k. All rights reserved. No photograph from this web page can be reproduced without a prior receiving my personal permission (i.e. signed personally by Dr Jan Pajak) obtained in writing and issued specifically for a given photograph.